GLENDALE, Ariz. — The Packers’ 38-8 loss to the Cardinals in Arizona on Sunday night means the NFC North title will be at stake next Sunday at Lambeau Field when the Vikings visit Green Bay. Green Bay dropped to 10-5 on the season. Minnesota (9-5) was playing later Sunday night vs. the Giants. Regardless of that result, the winner of the Week 17 Packers-Vikings game will be NFC North champion. Arizona (13-2) clinched a first-round bye with the win and still has a chance at the No. 1 seed in the NFC following the first loss of the season by Carolina (14-1) earlier Sunday. The Seahawks were losing to the Rams at the time of this posting. If Seattle loses that game, the only playoff seeds in play for the Packers would be the No. 3 or the No. 5. The Packers would earn the No. 3 seed by beating the Vikings next week, or the No. 5 seed with a loss. If they were to win the No. 3 seed, Green Bay would host either Minnesota, Seattle or Atlanta on wild-card weekend. If the Packers get the No. 5 seed, they would travel to Washington to face the NFC East champion Redskins. Scott Tolzien came in at QB for Aaron Rodgers in the fourth quarter. Rodgers ended his night 15-of-28 for 151 yards with one TD and one interception. He was sacked eight times. Tolzien was sacked once as the Cardinals racked up nine sacks against a constantly shuffling offensive line. 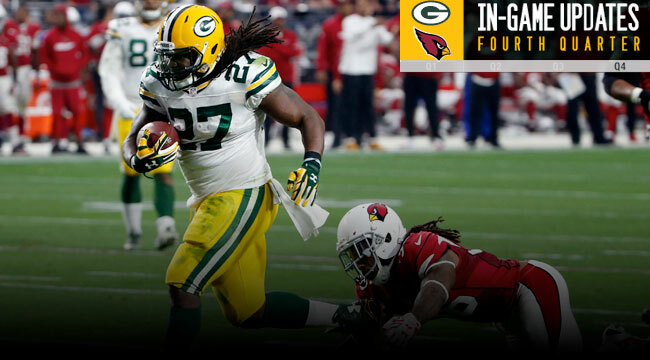 RB Eddie Lacy had 12 carries for 60 yards for the Packers, while WR James Jones had five catches for 46 yards. Cardinals QB Carson Palmer also took an early rest after going 18-of-27 for 265 yards with two TDs and one interception. Michael Floyd led Arizona with six receptions for 111 yards. RB David Johnson had 127 yards from scrimmage (39 rushing, 88 receiving) with a TD.